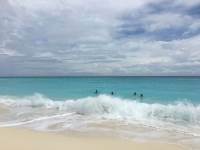 Local activities include cycling, scuba diving and deep sea fishing. The nearest golf course is a 10-minute drive away. 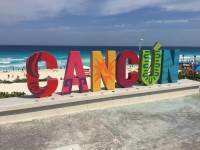 The centre of Cancún is 8.7 miles from the resort, while Cancún International Airport can be reached in 15 minutes by car. WE loved it and already are planning another visit. 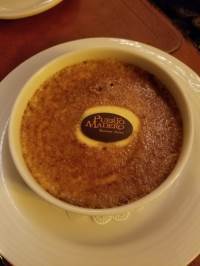 We had the best service at the Dragons restaurant, Juan our waiter, went the extra mile - we vaguely mentioned it was our anniversary, and he brought us a special dessert ! Overall a great experience and the ocean front view was amazing ! Thanks to the entire staff ! We stayed here for our honeymoon and it was the most amazing time. Everything about secrets the vine was faultless - the food, rooms, staff, entertainment, beach, views. I can't stop thinking about returning. The Asian restaurant is so so good, we visited a few times and ordered a few starters/sushi a main and pudding, all wonderful. The entertainment staff are ever so friendly and the housekeeping do a brilliant job. If you're thinking of going you should. Just amazing! Like the idea of not having to wear wrist bands like those run of the mill type all inclusive hotels. Friendly, courteous staff, attentative and great service. Good entertainment throught the day and evenings. Credit to the entertainment team for for their hard work. 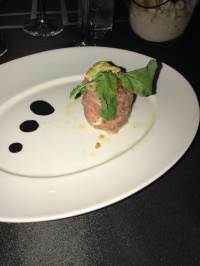 Fine dining experience. Fabulous food with 6 restaurants to choose from. Spoil for choice. Exceedingly good. My husband and I just gor married at a sister resort and came her for our honeymoon. Very beautiful resort, greeted with glasses of champagne and a complimentary breakfast in bed to help us celebrate. 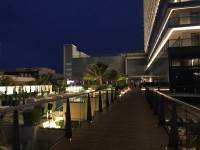 Night life was great and vibrant, always something to do, plenty of pools and helpful waiters to bring drinks/food poolside. We had a wonderful time! Me and my friend had the best time at the hotel, from the moment we got to the hotel we were greeted with amazing service (from the font desk both Adrian and Ruben answered any question we had). 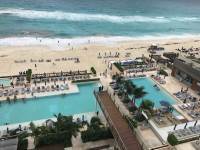 the pools are big and over looking the ocean really good entertainment crew specifically Moses. Finally the restaurants were amazing very high quality meals we ate all day long. 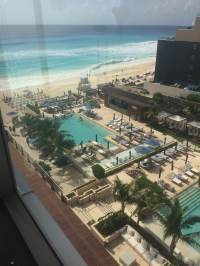 the experience at the hotel made it very hard to leave cancun. We traveled as a group of 3 the week of Sept 29-October 7. We used USA Transfers for personal transport to and from the airport, as we do every time. Their price is $55 round trip for all 3 of us and the best price you will find for private transport. 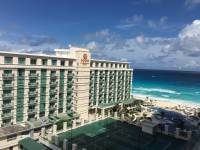 We have stayed at numerous resorts in Mexico over the past 18 years. 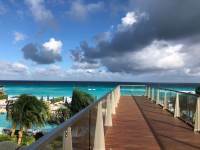 Among those resorts are Secrets Capri, Silversands, and Maroma Beach. 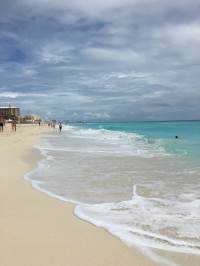 We have also been to Secrets in Jamaica, Cozumel and Punta Cana. This was our first visit to The Vine.We were upgraded to a master suite, very nice, with 2 restrooms. The patio was nice with a view of the beach and inlet. The room was comfortable with nice, cool air , which sometimes may lack in Mexico. The bed and pillows were comfortable. We had a nice latte machine in our room and the room was stocked daily with chips and drinks. The TV in the room was a smart tv, so we could use our Netflix, which is a bonus. We have taken our Fire stick in the past and utilized this for Netflix.The pools were all nice and refreshing. 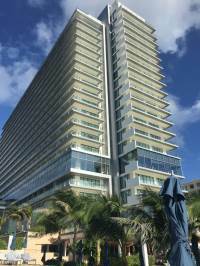 We only went to the Preferred pool once as it was quite a way from the beach, etc., located on the 21st floor. We did have Preferred club status at this resort, but not sure if we really needed it since we didn't access the pool much. All of the pool lounge chairs have a comfortable cushion seat and there were plenty of towels. This is the first resort we have been to where we could come to the pool around 9:AM and still have plenty of seating options. At other resorts, the seats are taken by 7:AM. We had a waitress bring drinks daily, and they will allow you to order food at your seat as well. The drinks were great and food was good.The beach was beautiful, as was the water. The beach chairs are horrendous. We usually spend our time at the beach but the chairs were so uncomfortable, we didn't return after the first day. On our last day, they released baby sea turtles into the ocean which was a great end to our stay.We tried every restaurant at this resort. They were all average in food choices and quality, other than the Dragons restaurant where we went on 3 separate occasions. 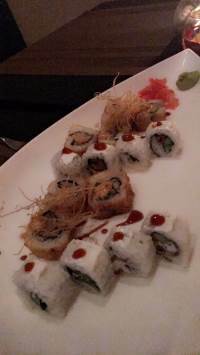 The sushi was delicious (Spider and The Vine...the BEST). We had about all of the appetizers, soups and fried rice with teppanyaki steak, chicken and shrimp - all delicious. The fried ice cream is great too. Our waiter, Thies, was excellent. Make sure to review the dress code for restaurants as most require pants and collared shirt for men. My husband takes 2 pair of khaki pants, several golf shirts (which don't wrinkle) and a pair of closed toe Crocs. I take several sun dresses and just 2 pair of sandals (non flip-flop). Men must wear shirts with sleeves even in the buffet food area.The entertainment was lacking a bit - we did go to the circus show one evening and it was neat. Other than that, we skipped the rest, it just didn't sound interesting. I did enjoy the piano player every evening in the lobby and in the late afternoon, they had entertainers by the pool, which was fun to watch. They had an amazing violinist one day. I usually take a raft with me, a cooler to take to the pool, and bug spray. We didn't take a raft this time and they were scarce to come by...I saw a few at the Preferred pool. We didn't need a cooler as the waiter was on top of it and there were bars everywhere for a drink. We did not need insect repellent at all.If you have Preferred club status, you may enjoy one free day at the spa at no additional cost. 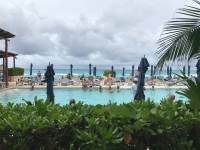 We had a rainy day and did utilize this, which was nice and relaxing.Overall, as Vacation Club members, we enjoyed this resort and found that it was worth the money as we had a discount through our membership. 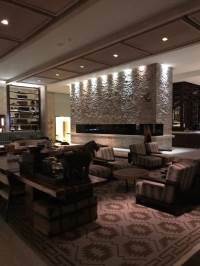 Our friend, a non-member, paid a lot for her room and stay, upgrading to Preferred club. 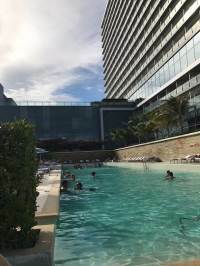 Other than the easy check in and out via Preferred club, we only utilized the pool once, along with the restaurant once, so I'm not sure if it's worth it. 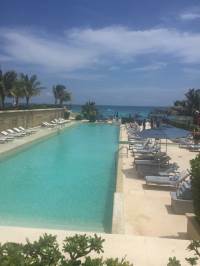 My husband and I have been to many Secrets resorts and I'm not sure why this one is so much more expensive than the others. We enjoy Silversands as much, if not more, for half the price. 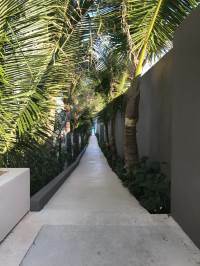 This is more of a hotel setting as opposed to a resort feel.An additional bit of advice - there is a pharmacy right across the street from the resort. They sell EVERYTHING. My friend had a horrible muscle spasm in her neck. We were able to purchase Voltaren cream, Flexeril and steroids for cheap. It saved her trip, really. There are numerous other items you may purchase, such as Cipro and Phenergan, in case you fall victim to vomiting and diarrhea from the drinking water. We have found that starting a probiotic about a week before, during and a week after our trip helps to prevent this. We don't worry about water, ice, or any of that. I even brush my teeth with the tap water (but use bottled water for drinking purposes, or the water offered in the restaurants which is filtered with the ice). No worries! 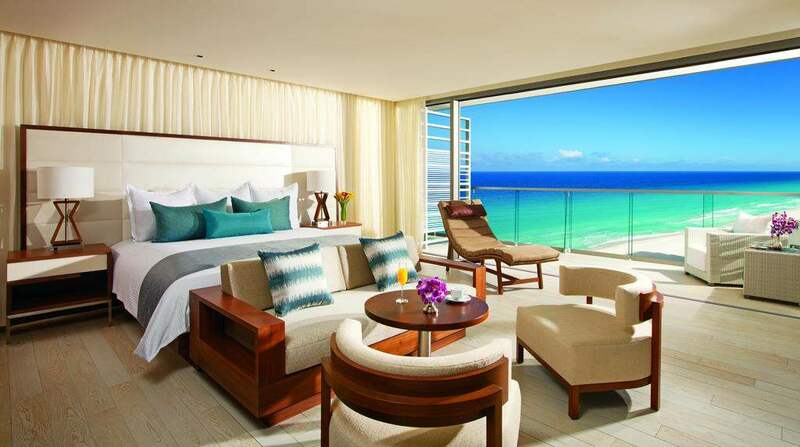 We booked this hotel for our honeymoon and we booked an oceanfront honeymoon suite. The room was amazing, really large, huge double shower, long double sink, heaps of cupboard space, large wrap around balcony, hidden tv. 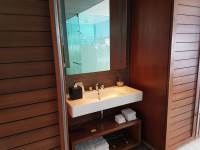 However one of the nicest features of the room which is the large bath overlooking the ocean can not really be used to your benefit. 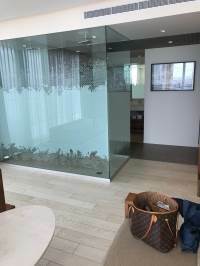 The bath can be viewed from other rooms which have a view straight into the room. It also took 45 minutes to fill and was not comfortable. You couldn't lie in the bath comfortably. 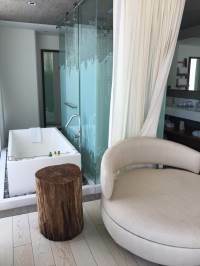 This really sucked because I was looking forward to the relaxing bath overlooking the ocean. Great housekeeping with a seperate turndown service at night. Amazing food at all the restaurants, no reservations so sometimes had to wait for a table especially when you are dining with a bigger group. 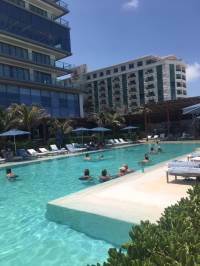 Great service around the pool, great cocktails and food all day. Make sure you tip. Take lots of one dollar bills. I know it's all inclusive but you really need to think how much your paying and how much these amazing people are getting paid. If you can afford this place then you can afford to give these hard working legends some extra cash. It will also guarantee you non stop service. The staff here really make the place. They all work so hard and are always smiling and happy to help. The entertainment staff are amazing and deserve so much praise! They made the trip fantastic. 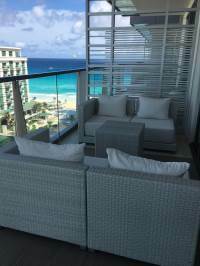 Room tips- even if you aren't preferred ask for a room on the highest floor possible for the best views. Be careful at the beach. Don't swim if there are red flags. This means there are rips and it's super dangerous. On our first day the guy manning the beach told me it was safe to swim which I think was a miscommunication because it was not safe at all. We came in wet season so the weather wasn't the best but it was also quiet so very easy to get chairs around the pool and it was still warm despite being cloudy with the occasional downpour. Would definitely return. 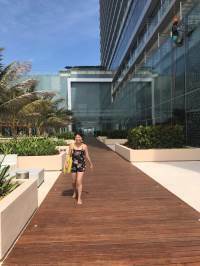 This was my fourth visit to Cancun and my favourite hotel so far! Great work guys! If you get the chance to take advantage of the cooking class with the Executive Chef it is a must. We were with a group of 4 and the lovely Aline from the Entertainment Staff came around the pool as asked us if we would like to join. This is not a normal cooking class where you only make something small. Aline said we would not be disappointed and she was right. There were a total of 10 people. Aline escorted us up to the Executive Chef's kitchen where we met the E.C., Javier. Each person in the group got to participate in making the meal. We made a homemade 3 course meal:1st course: Caprese salad with homemade pesto sauce2nd course: Filet with Prosecco and Parmesan Risotto/Asparagus - this was the best filet we ate the entire trip!3rd course: Fried ice creamAfter each course we were taken to a nicely set table to eat and were served wine.Hats off to Aline for asking us and Javier for allowing us to cook in his kitchen and Maria for showing us how to make fried ice cream. This was a fantastic experience and it was free!!! I absolutely love this hotel. It's an adult only resort. We arrived and was greeted with glasses of champagne and whisk away to the preferred check in area. They surprised us and upgraded us to a beautiful suite, with a wrap around balcony. Our room was decorated and they gave us a bottle of champagne. The hotel was very clean. 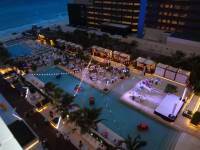 Plenty of pools, pool bars, restaurants, and the piano bar was the place to be after hours. This hotel is All Inclusive!! I highly recommend this resort. We're already planning our anniversary trip to Secrets.. This is a very delayed review, but I'm writing it today because we just checked into our third Secrets resort in 4 years. 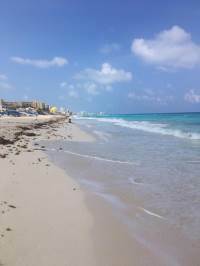 We stayed at Secrets The Vine in November 2014, and it was our first trip to Mexico ever. We absolutely loved it! We had the most amazing time...to this day we still talk about how good it smelled in the resort :) I wish I could bottle it and wear it as a perfume! Since staying at The Vine we've stayed at a couple other secret resorts, and The Vine definitely has a "glitzier" feel. 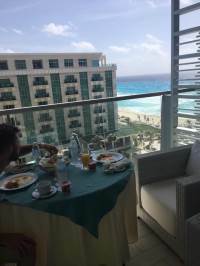 It's right on the Cancun strip, and our room faced The Hard Rock Hotel so we got a firsthand glimpse of Barney through the upper windows at a Kids show one night We booked a preferred club suite so we had access to the club level pool which was clutch. The other pools got very crowded during the day! But overall it was just a wonderful experience. That's why we've returned now to our third Secrets resort! Go and enjoy!! 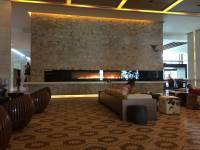 We just got back from our stay at Secrets The Vine. We had a fabulous time! Our room was gorgeous, the food was great and the service spectacular. I'd definitely recommend! We had massages in the spa that were incredible. Prices are high but you can negotiate. We got ours two for one. Dragon was our favorite restaurant and the food in the sports was surprisingly great! 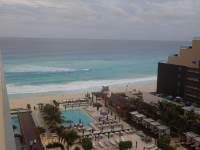 I won't travel to Cancun during hurricane season again though, the water was so rough. The waves were much too strong to get in the water. The only negative thing that I could say is that most of the restaurants require men to wear pants and close toe shoes. We are on vacation! They should allow men to wear nice sandals or flip flops and nice dress shorts. 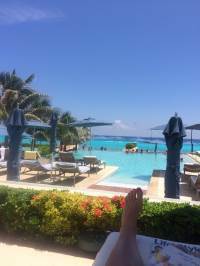 I stayed in Secrets for 10 days with my boyfriend and friends, and it was fantastic! 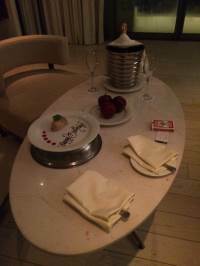 I loved the touch of champagne and hot towels on arrival! 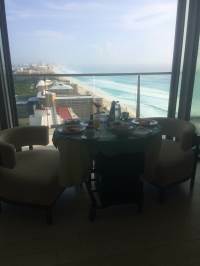 We opted for the preferred club so had a room on the 25th floor with beautiful views of the pool and beach. The added touches of m&ms and Pringles in the room, as well as daily mini bar restocking were great. The room itself was lovely, very spacious, comfortable bed, Netflix on the tv, large balcony area, USB sockets etc. 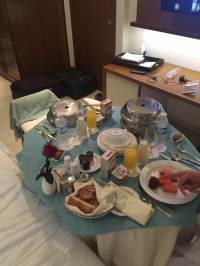 The room service tablet was great - we ordered breakfast to the room one day and it was a very efficient service. 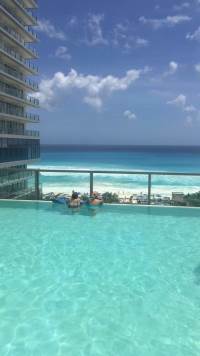 There is an infinity pool on the 14th floor for preferred guests but we only used this once on the first day as we found it a little quiet. We instead used the main pool, lots of sun beds and amazing staff! Especially Alberto - constantly making sure we had everything we needed! There is a BBQ at the pool area which we had most days for lunch. If not we ordered from the pool bar menu. Breakfast was amazing!!! A huge buffet with everything you could want. I especially liked the omelette station! My only negative about the food was the lack of vegetarian options on the dinner menus. 4 of the 7 restaurants had ZERO vegetarian options on their main course options. I asked the the Blue Water grill if there was any options and he said no, only the option of a side of ratatouille. Which really isn't good enough to offer to a vegetarian who has paid for an inclusive holiday! Therefore we chose Dragons and Nebbiolo most nights, which limited our dining options. There is a well equipped gym as well as daily yoga, aqua aerobics etc. The only other negative I have about the hotel is the price of treatments in the spa - $180 for a massage!!! So we didn't end up visiting the spa. Despite these small negatives, we had an AMAZING holiday. I would highly recommend Secrets to anyone. Definite 5 stars *****! We are already looking at visiting another Secrets hotel next summer! This resort has it all going on. We have traveled to many resorts and this resort topped all in regards to service, food, rooms, amenities and whatever I missed. 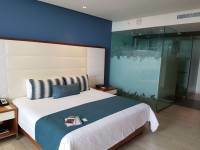 We were so sold on Secrets We booked to go to Secrets Huatulco in February. The views from the beautiful room and the decor were top notch. The Beach and pools were awesome (umbrellas for everyone anywhere you wished and no lack of loungers, all with great views of the beach or pools and waterfalls. We upgraded to the preferred club but personally din't feel is was necessary as the pool on the 12th floor was murky and very hot. The food was wonderful and obviously chef inspired in regards to favor, portion size and presentation. Breakfast room service was outstanding. You order on an Ipad and it comes on a heated trolley that converts to a table with a white tablecloth that is put by your balcony with the view. Just lovely. 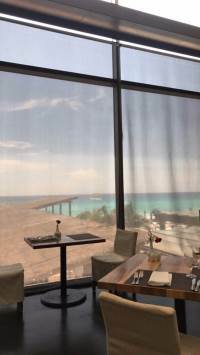 Also the gym had everything you could want, was super clean, cool, and was over looking the beautiful beachThe nicest part was that it was my birthday and my husbands and our anniversary, and nothing went without note. 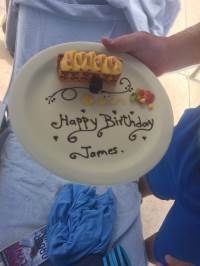 Balloons and banners, cake and sparkling wine and on my husbands birthday the bar tenders around the pool found out it was his birthday and without asking delivered an ice bucket with sparkling wine, glasses and a birthday cake to our loungers. Talk about "cake by the ocean".All in all. Loved everything about Secrets the Vine. So much to say about this place! So I will start by saying this... my review may come across a bit clinical but it's only because I have so much to say and want to fit it in. I am 25 and am fairly sure I have already visited the best hotel of my life (this one!! 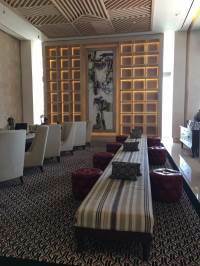 ).On arrival you are greeted by the doormen, our bags were taken immediately and we were given a glass of champagne at the check in desk. Straight away we were given the option to upgrade which was a bit annoying considering how much we had already paid! But I guess this is just standard procedure. So anyway we were taken up to our room by one of the staff and given a tour and he explained a few things about the hotel and our room to us. We stayed in the junior suite, the cheapest room available and it was just beautiful. 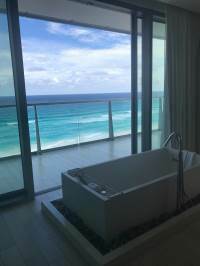 Every room has an amazing view here; the ocean one side and lagoon the other. 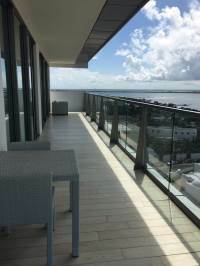 All rooms also have balconies. Make sure you keep your balcony doors shut as much as possible. It's pretty humid and the room gets quite sweaty if not! There was his and hers sinks and we had a wardrobe each. The shower is pretty much the size of my whole bathroom at home. There is a normal shower head and a waterfall shower head. 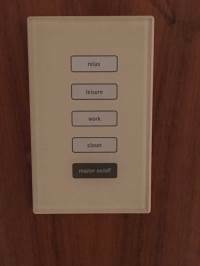 There are many light settings in the room (relax, welcome etc), very nice touch! Smart TV including Netflix which was good to chill out to for an hour or so after the pool. There is a coffee machine that I couldn't get the hang of at all and also a mini bar with water, soft drinks and beer which is replenished daily. 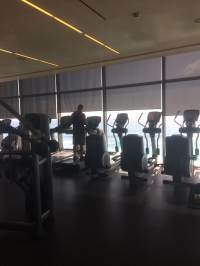 Oh and the maid comes twice, once around noon and once around 8pm for turndown service and to deliver the itinerary for the next day at the hotel.There is a gym with panoramic views of the ocean although we only used this once on the first morning when we were jet lagged! We didn't use the spa but there are many treatments on offer. We found them a bit too expensive on top of the price of the holiday, but I guess that is expected in a hotel like this. 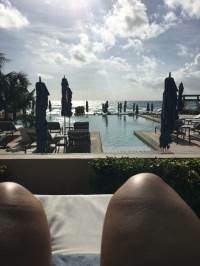 You are given resort credits that you can use at the spa but you still have to pay a lot of money on top.There are 3 pools, they vary in temperature but are all heated. There's also a small jacuzzi style pool which is very very hot! There is a waiter at the pool who comes around often to check if you need another drink. You can also order food to eat at the pool like fajitas and sandwiches. I had the fajitas and they were beautiful! 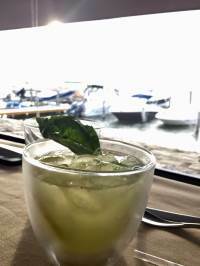 There are many cocktails on offer and I tried a few I'd never heard of before. 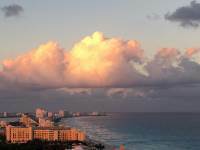 Try the Miami Vice cocktail; a layer of strawberry daiquiri and a layer of pina colada.There is a section of the beach reserved for guests of the hotel. If there are no beds the guy working there will go and get you extra ones. There is also a waiter service on the beach. Although down there you also have the guys walking around trying to sell you cigars which can get a bit annoying. The beach is lovely! 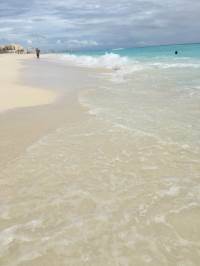 Beware of the waves, I’m only small and 1 of them knocked me right under the water much to my boyfriends anusement.Now on to the best bit... the restaurants!! For breakfast there are 2 buffets to choose from. We only tried the market cafe one and it was amazing. So much to choose from. Although with it being Mexico a few things us English like are missing e.g. proper baked beans. They even serve champagne on the breakfast buffet. 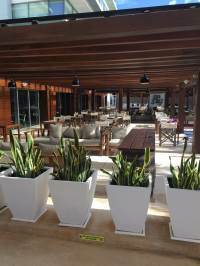 For lunch there is 1 buffet and 1 a la carte restaurant as well as food served around the pool. 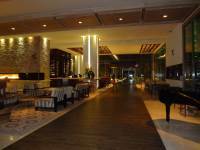 There are 6 a la carte restaurants and 1 buffet restaurant on the evening. 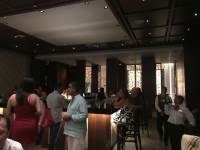 There is also a cafe by day/cocktail bar by night in the foyer of the hotel. They serve pastries, baguettes and sometimes pizza later at night. We tried every restaurant except the Italian. The steakhouse is unbelievable. I’m not huge on steak myself but it was beautiful. 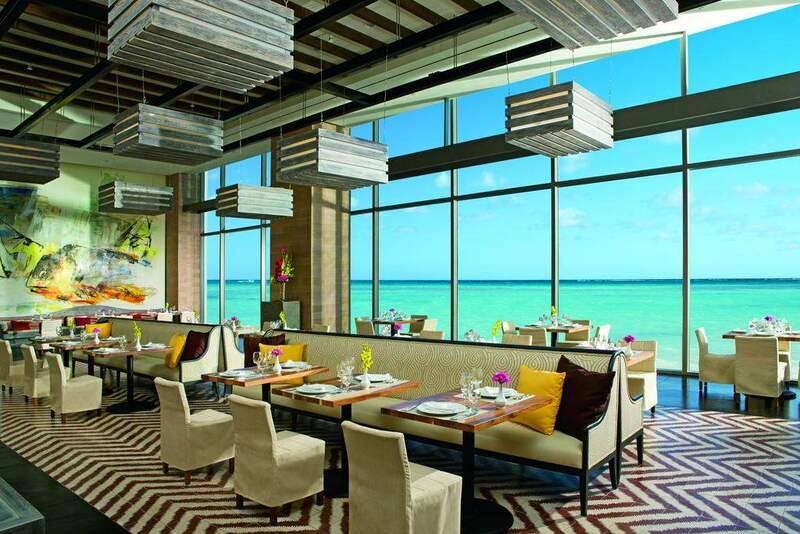 Although my favourite restaurant was the Sea Salt Grill. It’s outside and lit lovely. All of the food was just amazing. 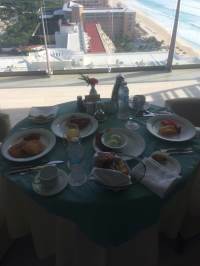 I do enjoy my good food and restaurants at home usually so I know good service and this was just top class.We ordered room service for breakfast twice on our stay. When the maid brings the itinerary on the evening she will bring you a breakfast card too. 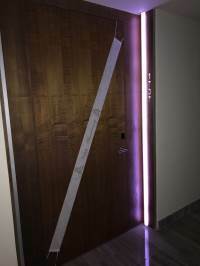 You fill it in and hang it on your door before a certain time and say what food you want and what time you want it and they will bring it in the morning. They bring the whole dining table into your room and unfold it with everything laid out. The first time we had a fry up, fruit, pastries, coffee and juice. I felt like the queen! We also ordered room service for dinner one night and I had the chicken enchiladas which I enjoyed.I must talk about the staff. Every single member of staff goes above and beyond to make sure you’re happy and catered for. The doormen, reception staff, bar staff, maids and certainly the waiters. At the pool and beach there are people coming round all the time asking if you’re ok. It’s not in an annoying way either. We were unsure about tipping at first, how much to give etc. We tipped the maid and the mini bar filler every other day. And tipped the meals on how well the service was although it was hard to fault it.I will say the 1 thing that may slightly let this hotel down is the entertainment. 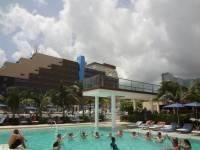 There is a lot of entertainment around the pool in the day which is great.. bingo, yoga, quizzes, water aerobics, dancers, singers etc. There is a sports bar with a pool table. And there is a piano bar which holds the nightly entertainment. We only watched some dancers and a magician. The piano bar isn’t very inviting and just seems small and dark. 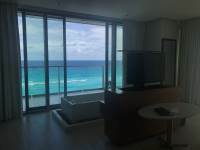 But then again you are in Cancun so I guess you’re only a 5 minute taxi ride to entertainment.If you are thinking of booking Cancun also, me and my boyfriend are in our 20s and enjoy a night out together. 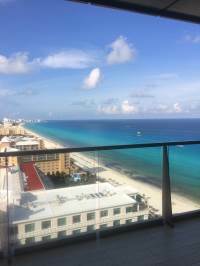 The Cancun strip where all the bars and clubs are was a bit of a letdown for me. 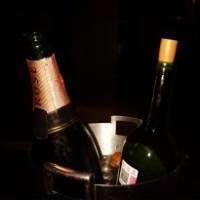 A lot of the clubs are a bit mental and even though that’s fun sometimes, there’s no cool chilled out bars there which I expected. It’s all a bit trashy and in your face. 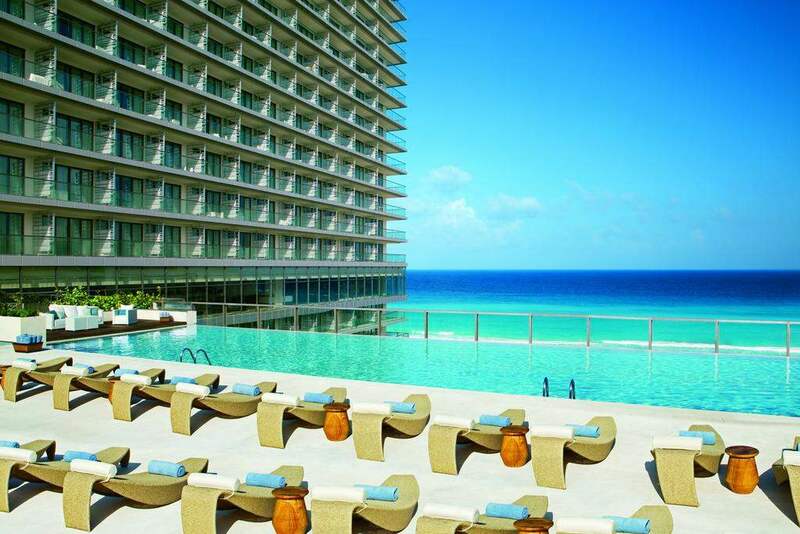 I wouldn’t really want to go back to Cancun for anything other than this amazing hotel. But it would be well worth going back just for the hotel! Hopefully some day. Pool side service was great. Bianca and Yoana were great! Quickly returning to check our status and quick with the drinks. Bluewater Gril was amazing. Evening shows were great too! 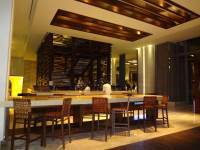 The sports bar was nice change in Cancun resorts. I had a 4 days / 3 night package. I enjoy the stay at Secret The Vine Resort. 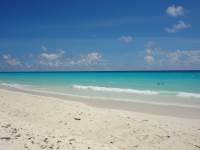 Friendly staffs and great services enhance the already beautiful beach front location. Took at bus to the city from this resort. It was easier than I thought. 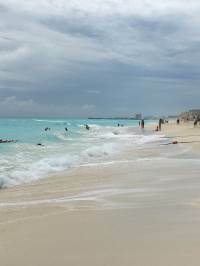 We took an all day explore trip to Tulum to visit Mayan ruin and underwater cave. Love it! This is one of the best hotels We have ever stayed at it terms of food at an all inclusive resort. It was great that most of the restaurants were sit down and provided a menu instead of a buffet (just my personal choice not a big fan of buffets). 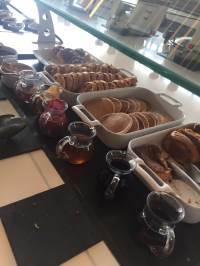 We did try the buffet at lunch, Market cafe and I was pleasantly surprised there was a huge selection to suit everyone's tastes and nicely presented, I particularly enjoyed the chocolate fountain. The staff were all so pleasant and I did not find that they expected a tip, although we did tip as they were all very hard working and so attentive! The entertainment staff were friendly but not pushy, made you feel welcome to join in but did not force you!! The room was spotlessly clean and very nice. I do not have anything negative to say about this hotel. Have now recommended it to all my family and friends! We Loved it!! We arrived at the resort and were seated with a vip relations person. Being that we paid for preferred I thought this was the thing to do. Wrong. They gave us 400 dollars in credits that we can only use at the spa. Cool. But you can only use 40 dollars per visit. Ok how much is the spa ? Over 200 dollars that’s out. Then asks because of my wife’s birthday would we like a dinner on the beach. Cool. But you have to listen to a thing about their club. Run from this. 2 hours of hard sell time share type of thing. Had us speak to 3 different people before we could leave. Then by the private pool they wanted us to buy a bottle of wine for dinner 100 bucks. The meal size was very small. The bottles of booze in the room were 3 airplane size bottles won’t be going back. I was spoiled at the excellence club down the road from here. Blows the doors off this place. The room and the staff were great. My husband, father, and step mother stayed at this resort on 9/1/17 - 9/9/17 for our anniversaries. Overall, we had a really good time! It was raining the first few days that we got there so we mostly hung out in the lobby. The resort staff did have activities for everyone, but I thought they could have had a little bit more things to do. They did a pretty good job of entertaining people, though. The hotel was very, very nice. 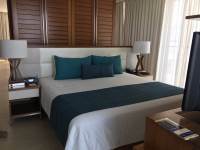 Our rooms were amazing, and the overall attitude of the staff was excellent! The only downside was that the lobby bathrooms were always hot. They were clean though. We would stay here again! 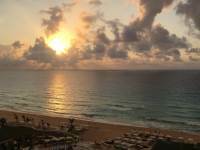 An amazing couples getaway... Beautiful resort, wonderful food, exceptional service. The rooms are beautiful and clean.. The beach and pool are lovely.. I can't say enough good things about this resort ! First time at Secrets The Vine. We visited 9/5-9/9 celebrating our anniversary. We booked a Preferred Jr. Suite on the 27th floor. 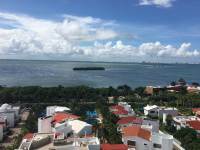 Great views of the both the ocean, lagoon, and property. My wife and I were very happy with the resort. 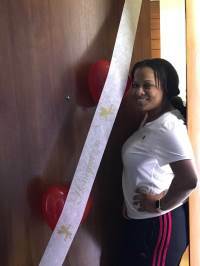 Miriam was our butler and put a "happy anniversary" sash on the outside of our room door. Special thanks to Alejandro and Oliver who made sure our drinks and food (beach and poolside) were taken care of. In return, we tipped these hardworking gentlemen well. If you are looking for first class laid back vacation, this is the place. Also the week of Labor Day isn't very busy so there were always spots at the pool and no waiting at the restaurants. The food is also very good. As mentioned in other posts, feel free to order a couple of entres to share as portions are smaller than the U.S. Be sure to ask Adrian (entertainment) how he became a beloved Bama football fan! Wanted to try this hotel out as I had heard a lot about it so decided to do a night there by myself. The hotel is modern and very clean with some really nice amenities. 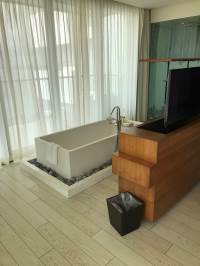 I had a suite room which was very large and was impressed with the large shower and spacious area. Would suggest to upgrade to the larger room. The restaurants offered a lot of options for everyone. I was only there 1 night so ate at the Asian one and it was great! I did have lunch and breakfast at the buffet and they had a lot of options as well. Food was good! The pool area was a bit crowded but was large enough to accommodate everyone. The beach area is great no complaints there. The gym is excellent! 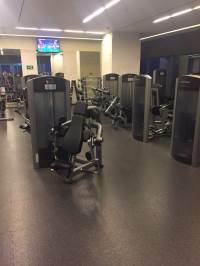 Has a lot of good Life Fitness equipment and had a variety and free weights. So if you like to workout this is a good spot. The place is full mostly with couples and I was by myself but if you want to take your special someone then this is a good spot. Overall, it's a good couples hotel if you're there for a quick trip. Dunno if I'd stay here longer term as it's not your typical massive resort but its certainly worth a try for a few nights. We were able to set the new world record of time it took to enter the front door of the hotel, check in, get to our beautiful suite, change our clothes and get to the beach. You really have to love that great prompt attentive service.The crowd at the hotel was mixed with people from all over the world, the average age was between 30-60 which really added to the international flavor and always makes it more interesting. We got to talk to people from Corea, England, Germany, Canada, Saudi Arabia, Colombia and Mexico. It is also a great sign when locals stay at the hotel because they know what's going on.The breakfast and lunch restaurant was a great way to start the day with happy faces like Cesar, Lino, Fernando, Martin and the hostesses, they were all spectacular and went out of their ways to make us happy. Good coffee, good food and great service. We ate in the Italian and Asian restaurants at night, the food was delicious. The host and waiters were happy and the service was overall excellent. Everybody we talked to at the hotel, said the same thing about the hotel's service.Our fantastic butlers Manny and Sandra were the perfect definition of what a hotel butler should be. Thank you very much for making our second trip here so spectacular.The coffee bar girls were great and happy. The towel guy in the beach, Guillermo, was so nice and so full of energy, he never stopped working, he was everywhere. He has the energy of a true leader, you can easily see him in a great position in a few years. Gonzalo was very nice too. We also got to talk to the very nice lifeguard.Jean Pierre and Leonardo, general and resident managers, made us feel special, which is the most anybody could ask for.Thank you Secrets the Vine for such a great vacation and a fantastic time, we really appreciate all the great service and attention you gave us. Never thought we would be happier the second time around, exceeded our expectations. Hope to see you again soon. We visited September 13-20. Booked Preferred Jr. Suite OV. Arrived around noon. We were escorted to the 27th floor by Miriam our butler. We were originally going to be on the Sandos side. We wanted to be on the Hard Rock side. Miriam made it happen. No problem. The room needed freshening up, so off to lunch. Went to Sea Salt. Ordered mostly all seafood. Service prompt, food was prepared to our liking, and tasty.Got our room. 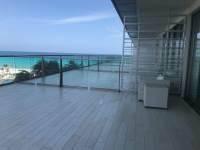 The rooms on the preferred level have to be some of the best in Cancun. His and Hers closet space. Double vanity sinks, and of course the giant glass wall shower. The usual Gilchrist & Soames toiletries. Even little tubes of Colgate whitening toothpaste. Sofia was our maid. She did a great job! Everything was tidied up when we returned in the afternoon. One day Miriam made a cute balloon animal while we were gone. Thank you Miriam.David kept our mini bar stocked with Mexican Coca cola. - My husbands favorite.Every morning we went to the Market Café. We met Cesar on our 1st morning. We asked to sit in his section for the next 6 days. However, if he wasn't available, everyone at the Market Café works as a team. We always were attended to promptly. This trip was just to relax and chill. We usually like to explore. Took part in some daily activities. Cooked paella with Aliene, played blackjack in the pool with Estrella. But our favorite activity is the kitchen tour. It is always so interesting to see how much hard work goes into all the food prep and presentation. Standards are high and everyone is proud to show you what they do. We enjoyed seeing and meeting the kitchen staff!Speaking of hard work, it was Mexican Independence Day when we were there. A outdoor celebration by the long pool was set up. Just to move all the lounge chairs and set up tables, was a huge undertaking. A buffet, complete with Mariachis, dancers, and fireworks to top off the evening. 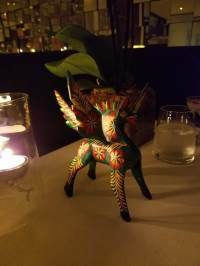 We ate dinner at Bluewater grill, Nebbiolo, Dragons, and the Mexican ala carte. All were good. Bluewater grill was our favorite.After dinner, we headed to the Time Out sports bar to see Jesus. What a great bartender. He made me a chocolate martini that was delicious. 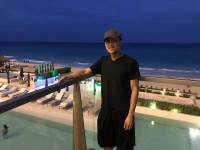 Beach -- I had the pleasure of meeting Gonzalo. He will get you a chair and find you a great spot to sit. I asked him if he always works on the beach. He said he is always on the beach, he does not want to work anywhere else. I told him that the beach is like his "office". I think he liked that analogy. We thoroughly enjoyed our stay at Secrets the Vine. I will be looking for a way to come back again soon. My wife and I just completed our stay here. Property is top-rate. The hotel is just a few years old and it looks it. 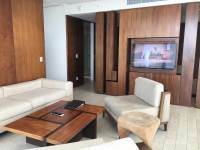 We stayed on the 26th floor which has a concierge / valet. Our valets, Jose and Esparza, were outstanding. In no particular order, here are my somewhat random notes: The gym has the most amazing view. 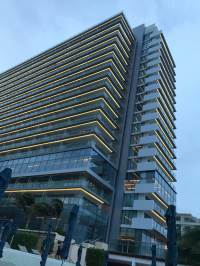 Located on the 12th floor, it has a spectacular ocean view. Eloy was very helpful; the machines and the gym were spotless, Favorite restaurant: the Italian place (ask for Francisco, he was great). 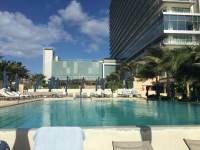 Favorite place: on chase lounges closest to the pool near the ocean. 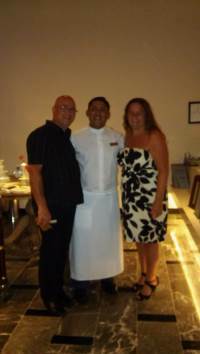 Alberto was outstanding as our waiter and he couldn't have been nicer. As mentioned before, the food was quite good. Seafood was my favorite, followed by chicken and sushi dishes. If you go for the concierge floors, there's a little cafe on 21 that served tapas-sized sandwiches, appetizers and desserts. Everything was bite-sized and really delicious. Next was a coffee bar on the main floor--the ladies serving us were always helpful and friendly. The ocean: The waves were powerful and fun to bodysurf. Watch out for rip currents (swim parallel to the shore if you're caught in one) and always bodysurf hands-first to reduce the chances of a head injury. Our room was impressive. The shower was 5 x 8 feet (!) there was teakwood everywhere, "smart" lighting and thoughtful touches everywhere. Moreover, it looks like the room cost a fortune when it built. We were both impressed. Our maid was invisible to us, but she did a great job keeping things clean. One last thing. Although it's "all-inclusive" we found that tipping was greatly appreciated. To sum up: it's expensive, but it's worth it. My name is Paul and my wife and I and some friends just came back from our 9 day stay at the secrets the vine and had an amazing experience there. This is our second time going there. The service that we received was top notch and I would like to specially thank the supervisor of the bars Jesus Gamboa and few of the hardworking bartenders and waiters Jorge Sanchez, Angel IIanes, Roberto, Fernando, Lucas, Jesus, Giovanni, and Alberto and few others that I just can't remember their names. The food was phenomenal and just the whole ambience was amazing. 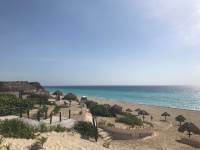 I definitely recommend this place to anyone who is traveling to Cancun. I will defiantly be back again. Everything was great service and food wise. Rooms were clean but beds could stand to be less firm. Would definitely come back and recommend Secrets to everyone. Plan on going back again soon. Ruben, Jesus and everyone else was awesome and nice. So this is our 2nd time at STV. We really enjoyed our first stay and thought we would go again. I think they have changed their business model as things were a little different this time around. First the good stuff.Room are great and clean. I do recommend upgrading to preferred club for larger balcony and room.Staff is friendly, Restaurants are solid. Steak house is best.Pool staff was attentive. Not as attentive as last year but our pool server from last year was not there this year. "Tip them and they shall come" is the rule of thumb.Entertainment staff was very nice. Liked Luis very much. Pool volleyball was always fun but not much in evening entertainment to speak of.Our "floor Butler" was friendly and responsive when we asked for something but we only really needed something one time the week we were there.The Bad Stuff.They must have changed their business models as this year everything was centered around selling us overpriced bottles of wine or liquor. I mean 2 to 3 times a day we were told they would make us a reservation or get a better seats at some small thing if we bought a bottle of wine. At home this wine is probably about $10 to $12 and there they started about $40 to $50 or much higherOne evening we wanted to go BACK to the steak house. We were told it had a 45 min wait for 4 people. (Understood but the resort was only 60% capacity) but then were told if you buy a bottle of wine we will sit you now. HMMM. Well that really bothered us. We were at a all "inclusive" resort we paid thousands of dollars to get to and are told to get seated in a timely fashion we would have to purchase bottle of wine. Empty tables we could clearly see but no unless we bought wine.We were told we could not use the spa /steam/ sauna unless we bought a massage package and then only for that day could we use it. Well I know you won't believe me but a 150 min couples massage they wanted $945 USD for! WOW! Gift shop was WAY over priced. Pharmacy right across the street so we went there and bought what we need for less then half the cost of same thing in gift shop.I have no problem paying a little higher for convenience but prices were terribly higher.So to wrap it up. Last year a 5 star as they truly stood out. 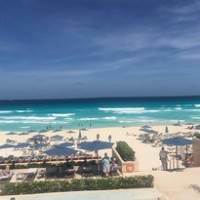 This year a 3 star as I suspect I can get same service for less at many other "all inclusive" in Cancun.If you go enjoy your stay. Know where the pressure is going to come from and avoid it and just relax. 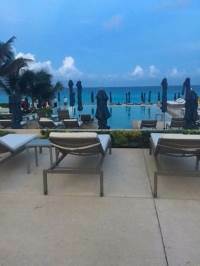 I could write a lengthy and detailed review of this place, but the only things that need to be said are as follows:Incredibly polite and attentive staffWonderful roomsPlenty of activitiesLuxury and service like I've never experiencedIf you're planning on traveling to Cancun, book this hotel! If it's possible, the upgrade to a Preffered Club room is worth it! Best hotel we have stayed in so far! We had our honeymoon celebrated here and we were definitely well pampered. We were looked after from the moment we have arrived. 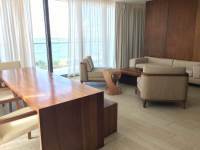 The stuff is very nice and the rooms are modern and big. The gym was amazing as well as the game room and the sports bar. Food was great even though some of the restaurants were quite busy at times and we had to wait to get a table. Overall I can’t wait to come back to this amazing place! Just returning home from Secrets The Vine, what a fantastic week. 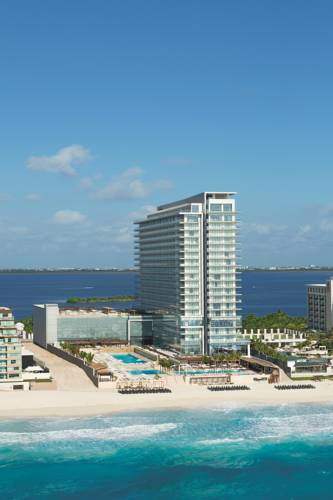 Secrets The Vine is located on Cancun hotel zone which has the most amazing stretch of beach with Caribbean blue water. 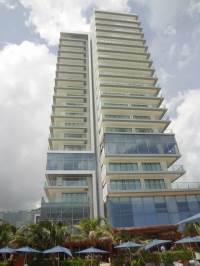 The hotel is a high rise, unlike other Secrets resorts with 28 floors, really 17 as they start on 11. 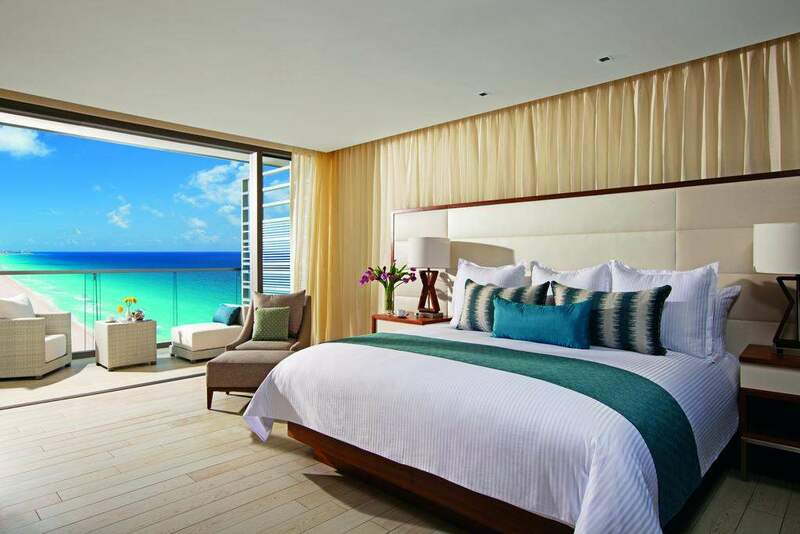 Very clean and spacious rooms, all with a view of the beach. 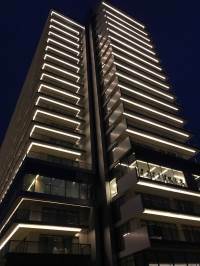 A concierge is on each floor for anything you need. 497 rooms, so it isn't small but never feels like its crowded.The beach water temperature was about 84 and perfect. The white soft beach sand doesn't get too hot. Gonzalo the beach attendant set up beach chairs and umbrellas for us every day and make sure we had the perfect spot. Jorge and others brought us all our drinks and lunch orders as well as snacks. There are a lot of activities throughout the day from pool and beach volleyball, bocce, dancing and Spanish lessons etc. Activity crew Raymundo, Dante and Luis made sure we all participated.There are three pools, the longest bust be around 150ft, great for laps. Wait staff at the pools bring you drinks and food if you like or you can head to the swim up bar, an afternoon hot spot. Pleasant music plays after 10am.There are 6 great restaurants and a buffet. The food was top notch in all of them with impeccable service. Tipping is optional but how to you not give $5 or $10 tip for such fantastic food and service? There's a Café in the main lobby area open 24 hrs for freshly ground coffee drinks, snacks and pastries. Loved it for late night bites.We did not get to the Spa, but some friends raved about it. 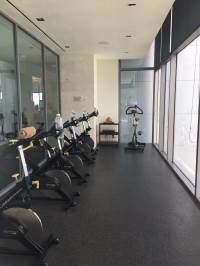 The gym is large with up to date equipment and a view of the water.My wife was there a week before I arrived for a girls trip for a total of 16 days. The girls trip was 19 girls. Her comments follow: I have to give a big thank you to Pathy for arranging tables for us each night for such a large group. I have been to all of the Secrets resorts except two and this had to be some of the best food ever!! The restaurants were beautiful and the service could not be better! Please show all these great people how much you appreciate the great service. I have to give a huge thanks to Leonardo the resident manager who made sure we all had the best of everything! We had a wonderful vacation at Secrets of the Vine. 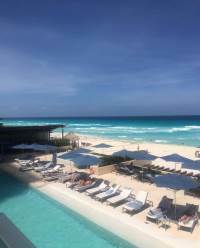 We love Cancun and have visited many resorts but this is our favorite one now! 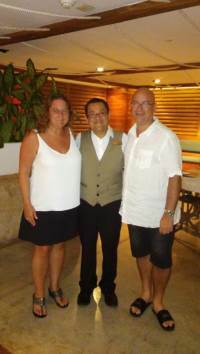 From the time my husband and I arrived, we were greeted and shown to our room by Ruben. He went out of his way to make sure our room was perfect! The entertainment staff is also very friendly and fun, especially Norby! We played volleyball with him everyday. Blanca is one of the waitresses around the pool and she was always great at knowing when we needed a cold drink or snack. 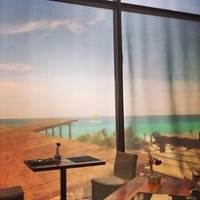 The food was by far the best we've found at any Cancun resort we've visited! Jesus was a fantastic bartender in the main lobby bar. The rooms are beautiful, the views are amazing and the staff is top notch! Sixth visit... lots of changes in five months..
As frequent returning guests, there have been many changes in the five months since we last visited. 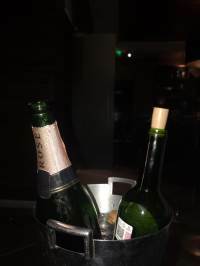 New guests will notice very little, but returners should be aware of some cost-cutting (senior management will know exactly the areas to which I am referring).The positives about The Vine are as always, the staff. Although, in such a short time there has been a serious turnover of guest-facing staff. Many new members are very enthusiastic but still finding their way and they seem to have less personal discretion in resolving issues or providing the "special touches" of former visits.Miriam, our butler was as outstanding as ever. A real pleasure to see you again.It was also good to catch up with Arturo and for a very short time, Gustavo. Mornings always commence with a visit to the Coffee Station each day and also with a very pleasant chat with Isobel, Enid and Estrella.Staff in the Market Cafe, on this trip, were brilliant! We received a warm welcome each day from Lizbeth, Astrid, Diana and Fernanda. The waiters led by the excellent Cesar, with Manuel, Fausto and Juan were attentive and helpful on each visit. 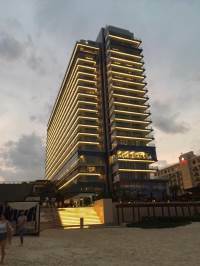 However, it was noticeable on this trip that some choices were more limited than previously and even some basic food items were not being replaced with the former customary speed.The Preferred pool staff on the 12th floor, were very personable and efficient. Thanks to Miguel, Moises, Roberto and Karla for their help.We thoroughly enjoyed the private Mexican wine tasting with Rudy - we had so much fun - and also enjoyed meeting up with Edgar again.Jesus is still a "star at the Vine Bar" in the evenings. Our meals at Dragon's were particularly enjoyable due to the attentions of the outstanding hostess, Jessica and thesheer professionalism of Thais. A waiter of exceptional talents...anticipating your requirements throughout!Our visits to Nebbiolo were much more 'hit and miss' this time. Some nights the service was outstanding.. thank you, Jose, in particular for your thoughtfulness over my food allergy and it was also great to see Jorge, Bryant and Giovanni. Unfortunately, our last night at the resort was very disappointing there. Some poor communications left us both feeling very let down. A shame!Gabriel in Bluewater was, again a very attentive waiter.Overall, we had another enjoyable visit to The Vine, but many of the little touches that made each stay so special were missing on this occasion and I hope that the cost-cutting exercise - (to fund the growth of the Brand elsewhere?) 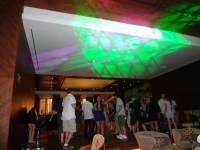 - might be a strategy that needs revisiting to maintain the loyalty of regular and repeat guests. Beautiful resort with nice rooms. Beach and pool area were great. The wait staff was great as well. Recommend the hydrotherapy in the Spa. Orlando at the front desk was very friendly. My complaint would be that the activities and food do not compare to Maroma. I was not thrilled with the food. Breakfast was the best meal this resort has. The Asian restaurant was decent. Air conditioner in general areas didn’t seem to work very well as it was extremely hot inside. I had an issue with my refrigerator and had it fixed within minutes due to the great staff. My favorite staff member was Fausto from the Market Cafe. I’d recommend requesting him too serve you if you visit. Last week my husband and I returned after a week away with a group of friends.We couldn't have been happier with the hotel. The room was spacious, but we did go with the Junior Suite with Butler service. We would definitely recommend this upgrade. We took advantage of the specialty floor lounge for snacks and drinks. The best part was the extra help that made our trip stand out. We had two great butlers, Laura and Edwardo. Laura really went the extra mile. She helped my husband surprise me with flowers decorating our room, helped to book a private catamaran for just our group, and even went to her local market to buy my son a piñata I wanted to bring home to my son. This made my trip very memorable.The pool was amazing and the staff there made it easy to just relax. 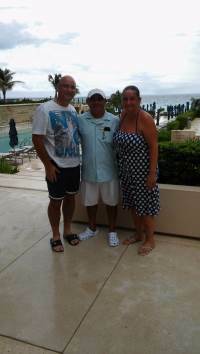 Oliver provided us the best pool service on two different days by always making sure our drinks and bellies were full. Get the Ojo Rojo and fajitas.The buffet in morning was great variety too and I had espresso every morning. Loved the fish restaurant. The Asian restaurant quality of food wasn't the best and the service was so slow and they got the orders all wrong. 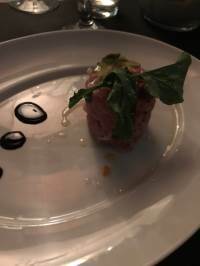 The waiter blamed it on the small kitchen, maybe it's better for a smaller party.The only complaint I have is that when I booked it on Expedia it said I got a $200 credit. Well, that's not really true. You get $200 worth of coupons, that I didn't use. Very misleading.Overall I would recommend. Best trip ever with my husband. So relaxing and the perfect get away from everyday life. A wonderful staff! Our room was perfect and the shower!!! We have never been more relaxed and comfortable. Will definitely love to come back! 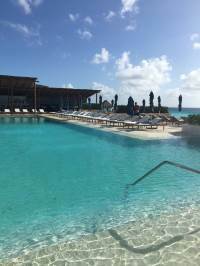 This was my first stay at a Secrets resort, and the entire experience was top-notch! 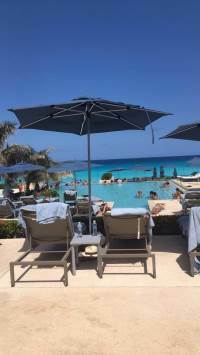 The food at all meals was outstanding, service was impeccable, accommodations incredible, and we had a wonderful bartender at the poolside bar named Jorge Sanchez. We hope to return again soon! My daughter got married at Secrets in August and our family got the most wonderful service throughout our stay. At the wedding one of our servers was Fausto and he was absolutely wonderful. He recommended the most amazing drinks for us when we weren't sure what we wanted. Two days later, we met him at 'the Market Cafe' and Fausto remembered what we were all drinking at the wedding and served us very quickly. We didn't even have to place the orders again. I hope that we get to meet him on our next visit to Secrets. Thank you, Fausto. Enjoyable vacation, the service was impeccable. Wonderful views of the ocean on one side and the lagoon on the other. The beaches were clean and nice weather in September. The breakfast/brunch was always on point.The entertainment could be better especially during the week. Dana Kennedy was amazing and the highlight of the entertainment for my entire stay. Her show was inviting and encourage interaction and participation; very personable and great voice. I will come back just to hear Dana sing again, her show was much too short. My husband and I went here on our Honeymoon and we were very satisfied! 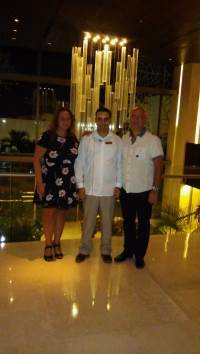 It was such a wonderful experience and we had excellent service. You feel completely safe at this resort because they have security monitoring who enter and leave the resort. This resort is definitely 5 stars. 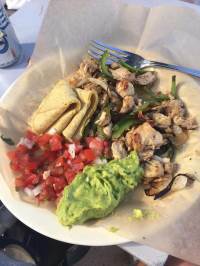 The food was great and be sure to try the fish tacos at Sea Salt Grill they are the BEST! Hope this helps! We were very happy with this resort. The staff is extremely helpful, everyone spoke English and did everything we asked. 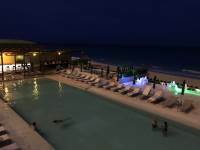 There are bars everywhere with excellent drinks, the food was great with many different places to choose from, there are many different pools that are all nice, the beach is perfect and the spa was a 10. This was also one of the nicest rooms I've ever stayed in. Only thing that was a little light was the evening entertainment. I highly recommend this place!!! All we could ask for ! Late post - sorry. We were at Secrets The Vine at Easter. We can't say enough about what a fantastic holiday we had. There are so many wonderful people there that help to make your stay unforgettable. Our room, our view, the food the drinks the service were all outstanding. Fernando on the beach and Jorge at the pool provided friendly and efficient drink service. Carlos at the Mexican restaurant went above and beyond when he offered us a dessert that wasn't even on their dessert menu. The entertainment staff all took the time to introduce themselves and ask if there was anything we needed. We met Emiliano and Valeria. They always asked if you wanted to be included in event but never pressured anybody to do so. Oscar and Edoardo aka "Fast Eddie"... but not fast at everything!.... 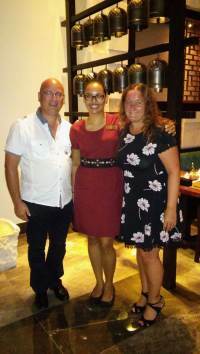 were fantastic and took the time to give us a fun personal 45 minute Spanish lesson one day while it was raining and everyone went inside.We enjoyed our week thoroughly and would highly recommend this hotel. 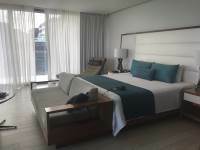 The rooms were spacious and clean, with wonderful views of the Caribbean. The water was beautiful, and the white sand beach was like powder. Just amazing. If only the weather had been a bit nicer, as we had 3 days with a decent amount of rain. I have one recommendation and it is very simple. Due to the rain we thought that the outdoor restaurant Olio was closed. As there was no notice on the door we went outside and indeed it was closed. 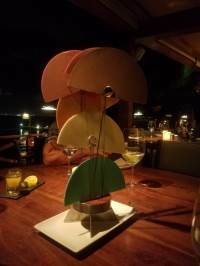 We decided to go to the Mexican restaurant and when we arrived there we were told that we could either eat from the Mexican restaurant menu or from the Olio menu. This was a pleasant surprise for us and we realized that we might have easily missed this opportunity had we not decided to go to the Mexican restaurant. I would suggest that it would be very simple to put a note on the door to inform people that it was closed but the menu was available elsewhere. 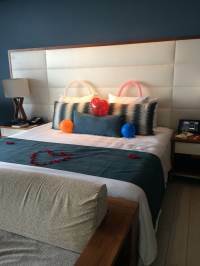 My boyfriend and I came to this resort for my birthday last weekend and he surprised me with an upgraded room in the Preferred Floors. We were immediately greeted by our wonderful Butler, Leticia, who showed us the room and made us feel at home. We went down to the pool restaurant for lunch and came back to the room and it was decorated with tons of balloons and rose petals all over the bed and written out "Happy Bday" on the ground. Leticia had coordinated a birthday dessert and wine and it was so lovely! This is just one example of how the resort truly made you feel like you were special. Unfortunately, my boyfriend ended up injuring his back pretty badly the next day while jet skiing and he wasn't able to move from the bed all weekend. We ended up extending our stay 3 extra days to let his back heal and rest. Although this was not how we had expected our trip to be, our butlers, Leticia and Alex, turned the weekend around for us... they were helping with buckets of ice, food requests and offering a helping hand when they could! Even with the circumstances, the trip was so relaxing and wonderful and we will definitely be coming back (just not jet skiing :)). The restaurants were great- specifically the steakhouse and Italian restaurant, and the breakfast buffet is phenomenal. Highly recommend this resort and thank you to the whole staff for making us feel so at home! First a shout out and thank you to all the Staff. 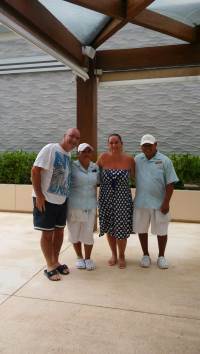 Having traveled in many countries and resorts, the staff were the kindest, friendliest, and most respectful I have ever met. Reuben, Isobella, Gonzalo, Veronica, Jorge, Boris...You and many others helped make our vacation one of the best ever. 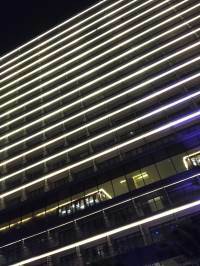 The hotel is beautiful feels like brand new. We were not 100% happy with our first room but the staff without question happily moved us and it worked out great. 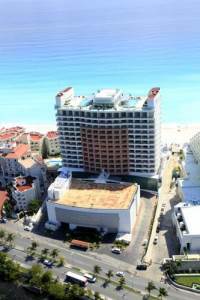 Location is great on the strip of beach with high end resorts nearby and jet skiing/parasailing right in front. We spent most days at the beach, the water perfect temperature and the wait staff couldn't be nicer there. Dining was sensation. Best service and our favorite restaurant was Olio (Mediterranean). The food authentic and the chef even came out to say hello at the end of our meal. My favorite stop every morning was a cappuccino and croissant and the coffee bar. Thank you for keeping it open 24 hours a day! Oh and the croissants...Of the best I have had anywhere! By the end of the week, the morning buffet got very busy, sort of a bummer. Good news is we made our way over to the Red Dragon restaurant which was quiet and had much of the same menu. The drinks served were very good, albeit there was no Anejo at the bars the Don Julio Repesado was just fine for my Margarita. In all, the staff, location, food, and ambiance was tremendous. Thank you Secrets Vine for such a memorable vacation! We will be back!